“Murraille, Marcheret, Maud Gallas, Sylviane Quimphe…I take no pleasure in setting down their life stories. Nor am I doing it for the sake of the story, having no imagination. I focus on these misfits, these outsiders, so that, through them, I can catch the fleeting image of my father. About him, I know almost nothing. But I will think something up.”—Serge Alexandre, speaker. Those who are familiar with the novels of Nobel Prize winner Patrick Modiano will immediately empathize with the references to the “unknown” father of the speaker in this novel. It is a recurring image throughout all of Modiano’s work, as it has been throughout his life. What he (and we) know from his later work is that he was the son of an actress who was away performing all over the world during his early childhood. His father was a man who, during World War II and afterward, cooperated with the French Gestapo as a blackmarketeer and blackmailer, a member of the famed French Rue Lauriston gang. As he shows in his most explicitly biographical novel Suspended Sentences (1988), Modiano and his younger brother Rudy were given by their parents to a group of circus acrobats to be raised when they were very young children, and they lived with them for several years until the acrobats were arrested for their own illegal activities – before Modiano had even reached his teen years. At this point, he was sent to boarding schools and rarely, if ever, saw his parents again, being mentored, fortunately, by Raymond Queneau, a teacher and famed French author. Author Patrick Modiano at age 24. 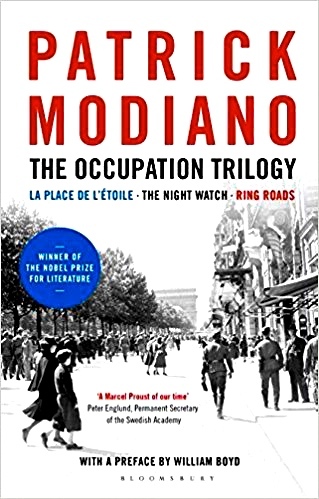 The three novels of the Occupation Trilogy, La Place de L’Etoile (1968), The Night Watch (1969), and this one, Ring Roads (1972) are Modiano’s first three novels, published when he was twenty-two, twenty-three, and twenty-six, and they made the literary world wake up and pay attention – not only because they were so finely written (and were winners of three major literary prizes) but because of their youthful energy and the fact that Modiano illustrated and addressed directly the issue of collaboration with the Germans during the Occupation. This was an issue which had been avoided in literature for almost all of the twenty-five years which Modiano himself had been alive. Instead, postwar writers in France had specialized in experimental new styles – the theatre of the absurd, surrealism, and existentialism, for example – as these more abstract styles evolved from the postwar horrors. Modiano, using the little he knew about his own father and the bizarre life he himself had led as a child, addresses his feelings directly in these narratives in which a speaker tells stories of real life, which often directly parallel his own life and experiences. His uncertainties about his own life also play a part in this early writing, especially in Ring Roads, as he switches between two time periods, ten years apart, in an attempt to reconcile aspects of what he has discovered about his father, and, not incidentally, himself. 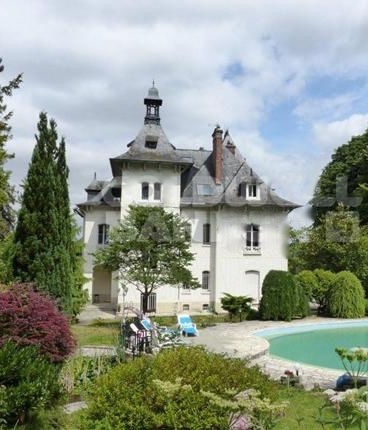 One of the large houses outside the Forest of Fountainbleau, similar to those occupied by the gang members. The novel opens with a speaker observing a photograph of three men at a bar, one of whom, the heaviest one, is his father, Chalva Deyckecaire, sometimes referred to as “Baron.” As he studies the three men, their posture, clothing, and jewelry, he imagines their positions relative to each other, concluding that his father is less important than the others. As the picture begins to come to life through the action, the three seem to form a partnership of some sort, and we learn that one, a “count” named Marcheret, was in the French Foreign Legion, and that the other one, Murraille, plans to give his niece’s hand in marriage to Marcheret in two weeks. They are all living in a pretty village near the Forest of Fontainebleu, apparently in houses abandoned temporarily by their owners during the war – large and elaborate houses filled with objets d’art, paintings, and antiques of all types. We learn that Murraille, the editor of “C’est la vie,” a magazine which seems to be a cross between a pin-up magazine and “a political and society weekly,” dispenses gossip, “makes scabrous comments about public figures,” and features “humorous” cartoons in a sinister style, leading the speaker to remark that “There’s something suspicious about the whole thing. Who are these people? Where have they sprung from?” Time is more than a little flexible here. At one point the speaker’s father is selling counterfeit stamps at the stamp market in Paris. The women in the novel are definitely not aristocrats. The female bartender had wanted to be a singer but became manager of a nightclub and has been charged with receiving stolen goods, leading to the natural question of where these came from and who supplied them. Annie Murraille, whose “uncle,” the magazine editor, has promised her in marriage to Marcheret, always wanted to be a great movie actress, and Sylviane Quimphe, who wanders the streets at night, recently managed to attract a man who gave her whatever she wanted financially and left her a Tintoretto painting just before he was committed to a lunatic asylum. Within this milieu, the speaker becomes more familiar with his father, sharing one of the elegant, abandoned houses with him and engaging in suspicious activities. 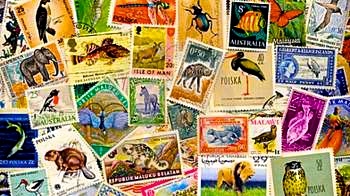 At one point Chalva, the father, is selling counterfeit stamps, as his son, narrator Serge Alexandre, is having great success inscribing dedications from one famous author to another in the frontispieces of rare books which he sells at enormous prices. A dramatic event involving the speaker and his father at a Metro station changes their relationship. 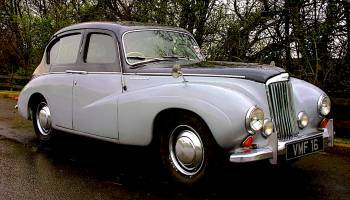 Throughout the novel, the speaker and his father travel in a Talbot motor car like this one, the Sunbeam, from 1948 – 1950. Without warning, the time and reality shift again, this time to ten years into the future, as the speaker has decided to look for his father again, reconnecting with Murraille, now described as a hack journalist who practices blackmail and bribery. Marcheret now claims royal lineage. The speaker’s father acts as the front man for the trio, and the speaker realizes that any attempt to save his father is futile. As he asserts himself, he, too, comes under the influence of the time and place in which this gang still operates, and he quickly learns that double-crosses are in process and that even human life is not sacred. There is a price on everyone’s head, and it is time for him to act in his own best interests. Just what the reader is supposed to glean from the conclusion is open to question, especially since so much of Modiano’s work incorporates parallels between the lives of his narrators, the actions of his protagonists, and the information he has learned about his father, but in a time in which the expressionists, the surrealists, and the existentialists are all experimenting with time, the missing connections here seem a small price to pay in this prizewinning novel by a twenty-six-year-old in search of himself. 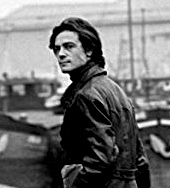 Note: Readers unfamiliar with Modiano may find that the best place to start reading this addictive author is with SUSPENDED SENTENCES, which gives much information about Modiano’s life as a child. The Yale University Press edition of the book also includes two other novellas which show the author as a young teen and as a college student. A great introduction to the author.